Whether you’re living in Mobile, Foley, Dothan, Huntsville, or elsewhere in this great state, there are many advantages to having a metal building that provides extra storage on your property. The outdoor lifestyle that many Alabama residents enjoy often comes with sporting equipment, yard tools, and other valuables that need protection from the elements in steel buildings. North Alabama farms are also popular places to use these sturdy storage structures, which are great for protecting tractors and other equipment. No matter what your needs may be, our metal buildings for sale in Alabama deliver. Whether your home does not have an existing garage or you need more room for storage, with our portable storage buildings, Alabama residents can get a cost-effective way to add space. When they buy our portable buildings, Alabama homeowners also often find that it increases the value of the property. And better yet, these customizable structures always come with free delivery and installation. Place an order with us and you’ll soon see why we are one of the most trusted garage-builders in Alabama! In Alabama, we offer several sizes and styles of steel buildings North Alabama residents and people all over the state can use for a variety of purposes. 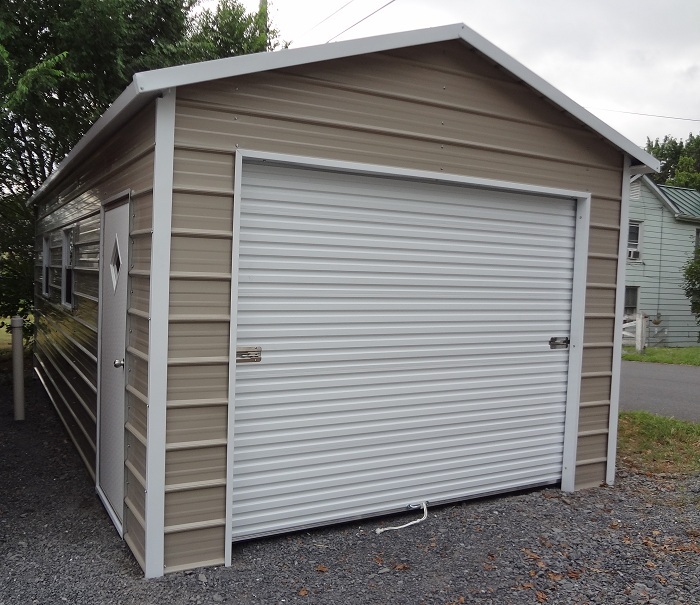 When selecting a metal building, Alabama property owners should make sure to look at all of our different options for metal garages, as customers can choose from a wide range of sizes, styles, and colors. 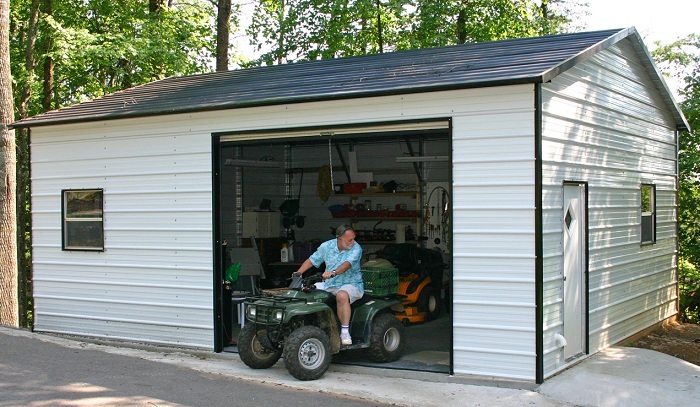 We also offer three roof styles for our metal garages. Alabama homeowners can choose a regular or boxed-eave roof for their structure, but many customers choose the vertical roof option, which allows rain (or even snow, should there be any) to slide off more easily. In addition, you can choose features like walk-in doors, garage doors, and windows, and you’ll be able to dictate where they’re placed on the structure. For instance, this vertical-style metal garage is 24 by 41 feet and has three 9-by-8-foot garage doors on the side, a single door, and three windows. This building also has optional vertical sheeting on the sides and ends, which is an option for metal garages in AL. This building has a pewter gray roof and sides with white trim. When it comes to customizing a metal building, Alabama residents have lots of opportunities to create something perfect for their property. And with these portable storage buildings, Alabama homeowners also can choose whether they want their new garage anchored to the ground or to a concrete pad. One of the reasons we’re among the most trusted makers of portable buildings Alabama has to offer is because of our knowledge of construction. From Huntsville to Foley, you can trust us to answer your questions about foundation requirements, helping you to create a solid space for your new steel garage. One important thing to remember is that the ground must be level prior to installing a metal garage. If you choose to use gravel instead of cement, you will need to make the gravel pad 2 feet wider and longer than the base of the garage. It is possible to place a prefab metal garage directly on the dirt or grass, but this is not as stable. At Alan’s Factory Outlet, we offer free delivery and installation with every order of metal garages in Alabama, so you can save even more money on your order and enjoy hassle-free setup. We install metal buildings in Huntsville, Birmingham, Mobile, and everywhere in between, including Alabaster, Auburn, Bessemer, Decatur, Dothan, Enterprise, Florence, Foley, Gadsden, Homewood, Hoover, Madison, Montgomery, Prattville, and Tuscaloosa. 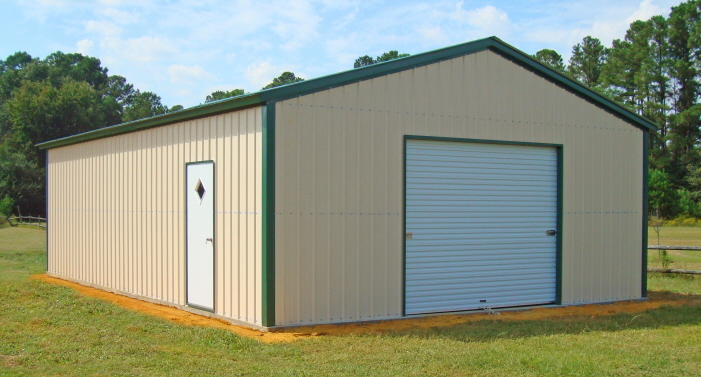 For fast, free shipping and setup of metal buildings, Alabama residents can count on us. Place your order today and you’ll see why we’re the top choice for steel buildings in Alabama!